So many cats arrive at our branch hungry, homeless and alone. Sponsoring a cat pen is a great was that you can help to provide them with shelter, food, warmth, medical care and the love they need. 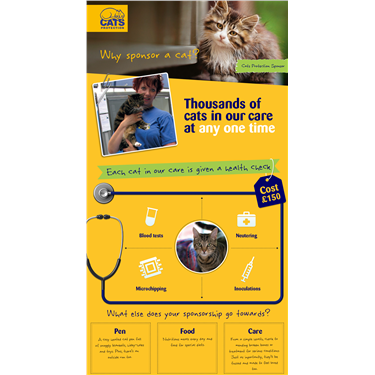 It's easy to become a cat pen sponsor and is only £6 per month. Cat Sponsorship also makes a lovely gift for a fellow cat lover in your life. Bolton & Radcliffe Branch will receive 100% of your sponsorship. You will receive a welcome pack including a personalised certificate, your first photo introducing you to the lovely cat you are helping to care for in your pen, a photo album to collect pictures of all the cats you help and a window sticker. We will keep you updated with regular newsletters and photos of the cat in your pen and will update you by email with photos, videos, stories and sponsorship news. Please note that you cannot sponsor our pens directly as the cats and kittens in our care are cared for in our Volunteer Fosterers homes. The link above is unique to our branch so when you click on it the funds will be diverted to our branch.